I prefer to knead the dough by hand (stress relief), but you could make the dough in a bread maker. 1) Combine the yeast, water and sugar in a large mixing bowl and leave for 10 minutes (it starts to ferment, and magic dimples appear). 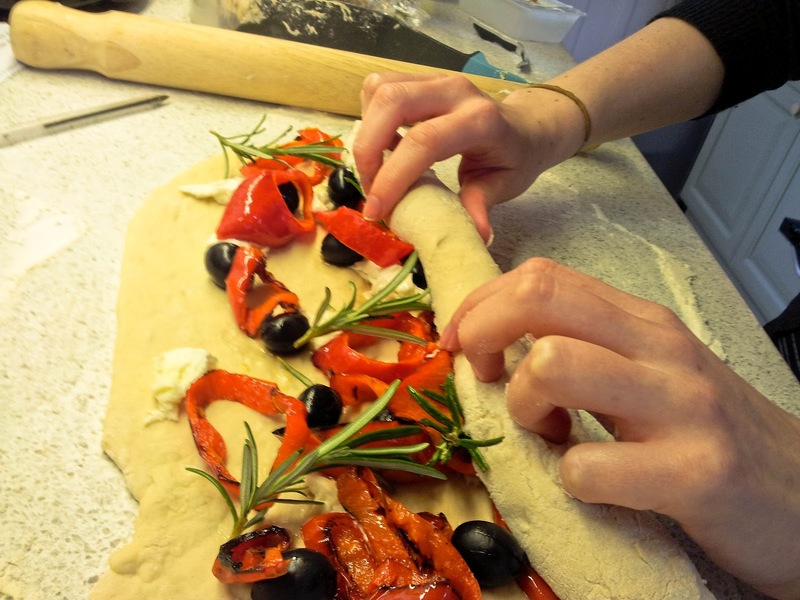 3) Add the rest of the flour and salt to the bread mixture, mix first with the spoon until stiff and then with your hands; combining all the ingredients until smooth. 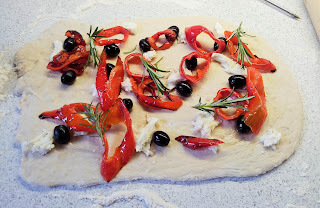 4) Lightly flour your work surface, and lift the dough on to the surface, and start kneading. The dough mixture will be quite sticky, but this all adds to the bouncy and light finished product. If it really is too wet, you have my permission to add a little more flour when kneading. Knead for at least 10 minutes (children love doing this, so if you have things to do, get them involved). 5) Lightly oil a bowl and place dough inside, cover with a damp tea towel, and then leave in a warm place again for an hour or so. It will double in size. Magic. 6) Whilst the dough is growing, slice the peppers into 1cm wide lengths. 7) Place peppers on a baking tray, lightly drizzle with oil and grill until edges are starting to brown, about 10 minutes, but keep an eye on them. (You can always chop the burnt bits off, don't worry). Set aside. 8) Another good step for stress relief. Punch the dough back to remove the air pockets. 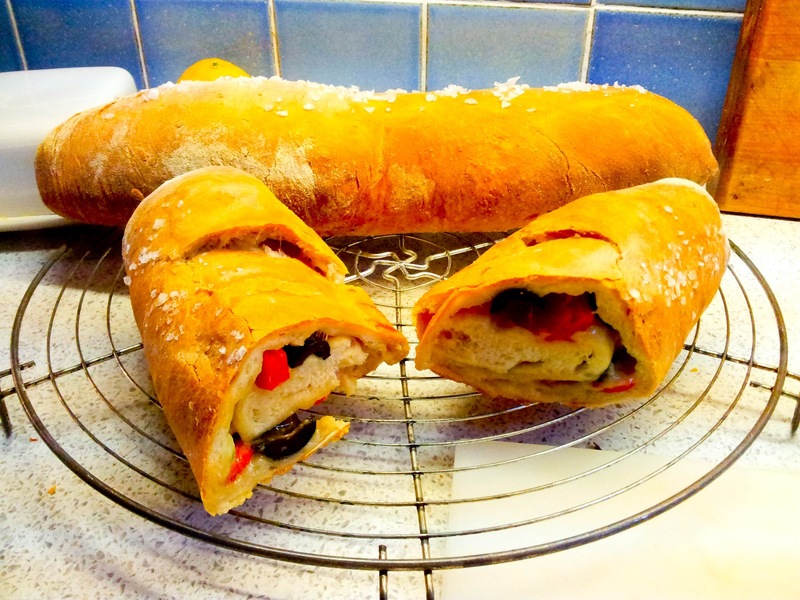 10) Scatter half of the mozzarella, rosemary, olives and peppers on to the loaf. Preheat oven to 200 degC (180 degC for a fan oven). 14) Cool for a few minutes, serve and enjoy. YUM!!! Once cooked, I froze one loaf for the birthday girl and left a message on it telling her to leave out covered for a couple of hours to defrost and then bake for around 20minutes at 170 degC.